Out of sight…out of mind. 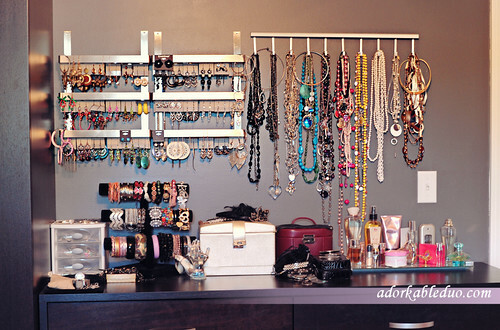 At least that is how it goes with my wardrobe – even more so, my jewelry. So, knowing this specific detail about my forgetful self, I went to Ikea (love) long ago and purchased what I thought could become my new jewelry display. 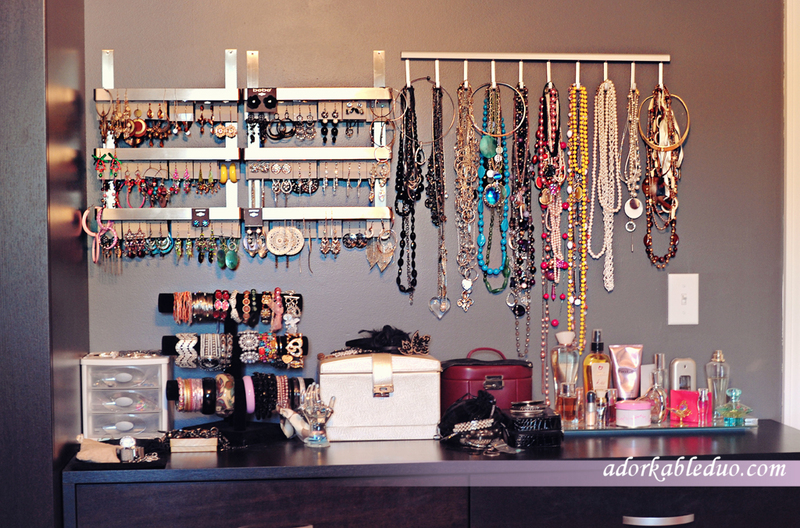 So if you don’t mind everything out in the open, here’s how I organized my jewelry. Enter: 2 spice racks and a kitchen pan rack. Corkboards and sheets of mesh were cumbersome and didn’t hold as much as I’d like. My Occasional Compulsive wouldn’t allow me to hang the jewelry up with varying card styles, so I also purchased earring cards in bulk to unify the aesthetic. Here’s what I ended up doing for my DIY earring display. This is pretty straight forward. I went to IKEA awhile ago when I was in college looking for inexpensive decor and organization items while I was living on my own. 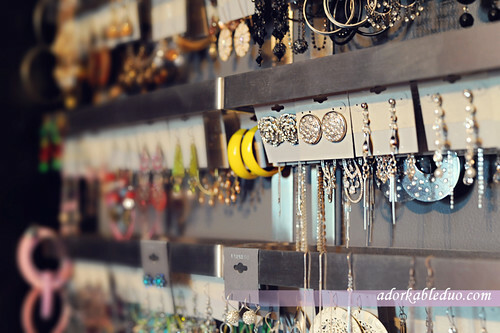 I knew that I have a tendency to purchase more ‘stuff’, in this case, jewelry, if it was hidden and I didn’t know what I had. As a starving college kid, I didn’t want to sacrifice anymore taco bell to my jewely fixes :). So, I found this Grundtal Spice Rack from IKEA. I didn’t use the hooks that it comes with; rather, I nailed it directly to the wall above my dresser. I actually bought two. I am that much of a jewelry fiend. 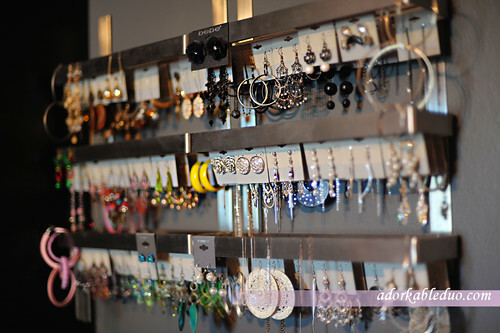 Then, with the earring cards I purchased to reduce the crazy colors I’d see looking at this thing, I hung up my earrings. The all grey cards made the jewelry stand out a lot more than the store cards. At one point, the Grundtal width changed. I was able to put three standard 2" earring cards between each rack, but now, the later generation fits 2 3/4 so you can see how some of the cards sit cattywampus. Get’s the job done anyway. You can easily cut the cards down. 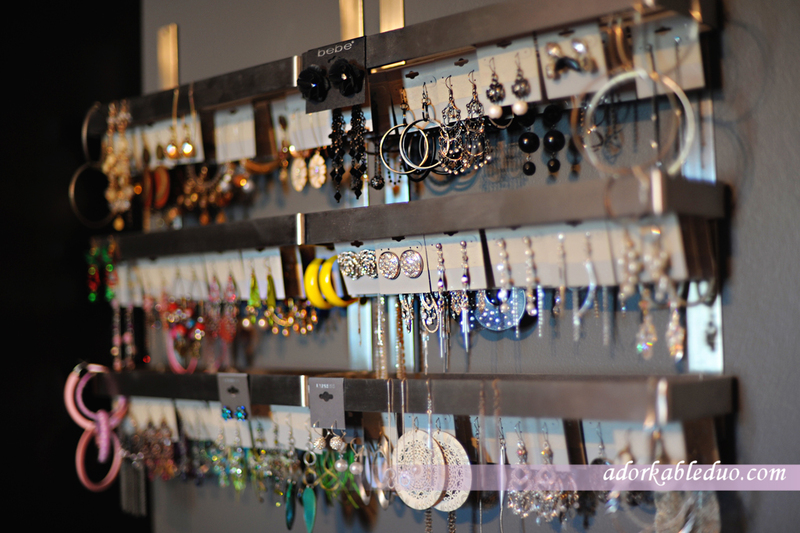 There you go… my nice and organized earring display. Read on here for my necklace display!